There was a time that, when a member of Trace Creek Baptist Church was sick or injured, ministers would add that information to the church bulletin so other members would know on Sunday. Now that message gets out much faster. “Facebook has turned into the best way to get things out there,” says Al Chandler, Trace Creek’s minister of children. Churches big and small around the region are finding ways to use the Internet to communicate with their congregations and reach new people. And the ideas don’t stop with prayer requests: Congregations across West Kentucky and Tennessee are using their own creativity and WK&T’s broadband network to find new ways to reach people through technology. Both Hazel and the Hardin Church of Christ post sermons online so members who miss a service or who move away can download and listen at their convenience. “They’re able to hear the sermons and some of the Bible classes while they’re away,” says David Smith, an elder at Hardin. The sermon files can be streamed on computers or downloaded to MP3 players for listening on the go. 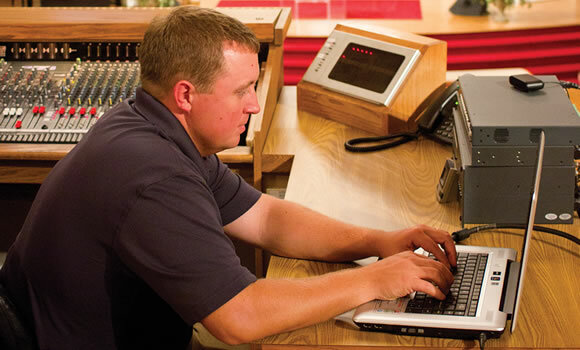 Churches are putting broadband technology to work — to stay connected with their congregations and to reach out to their communities. Alicia Tabers was excited to show her daughter the Christmas decorations she had set out around the house. As soon as Alicia saw her, she gave her a tour pointing out the trees, candles and other seasonal staples. The only unusual thing is that Tabers and her holiday decor were just north of Murray, Kentucky, while her daughter, Sara Darnell, was 4,700 miles away studying abroad in Regensburg, Germany. Through video chat, Tabers took her iPad through her home to help Darnell get in the Christmas spirit. Tabers is one of a growing number of people using services such as Skype, Google Talk, FaceTime and Yahoo! Messenger to talk face-to-face with far-flung family and friends around the country or the world. Tabers, who has WK&T’s cable, phone and Internet service at her store in Kirksey, Kentucky, says she expects those numbers will continue to increase. “I think if more people understood it, they would use it,” she says. Additionally, WK&T’s fiber service provides faster broadband speeds than most people can find in large cities — and WK&T’s service is often available for less money. For instance, residents of Cunningham, Kentucky, can get faster Internet than workers and students in downtown Paducah. Billy “Buck” Viniard, a Cunningham resident and WK&T member, says his home Internet speed is faster and cheaper than what is available to him at work in Paducah. “I’ve been very, very satisfied with my fiber service, and I’ve recommended it to several people who are on something else,” says Viniard. Throughout WK&T’s service territory, fiber is doing more than just building member loyalty and speeding up Internet downloads. Fiber is transforming the entire community. It’s furnishing teachers with the ability to teach with the Internet in their classroom. It’s providing new Internet-based jobs. And it’s increasing the speed and effectiveness of local emergency services. The possibilities fiber provides are only beginning. With a mobile device and a broadband Wi-Fi connection, residents of West Kentucky and Tennessee are staying connected with family members far and wide.